23 km. Cold morning, forecast calls for rain which obviously came later in the morning. Nice walk along the Galician landscape which is similar to northern Portugal but without the cobblestones. Streams and Horreos in some houses to keep their corn dry. They have some in Portugal but the Galician design is unique. The heel tendon kept at bay with the help of Gida and Ian's (Danish couple) Voltadol cream, got myself a tube at the pharmacy in O Porriño. The 100 km mark is also before the town. Also met up with Olivier there eating his lunch. Seems like everyone is pushing for Redondela. Not me (and Josie from Canada). A few km up from is a small hamlet of Mos with a municipal albergue I made my stop. Early meal and off to rest. All municipal albergue in Galicia are the same. 6 euros and they give you disposable pillow case and mattress sheet. Good enough for today. 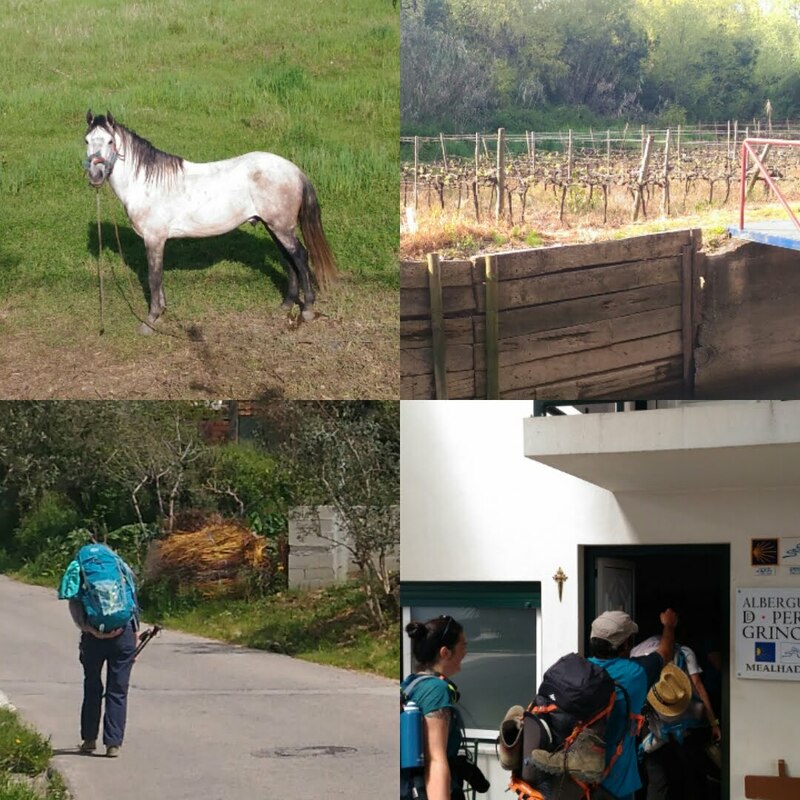 In any case, unless one is very aggressive, it's still another 4 days to Santiago. 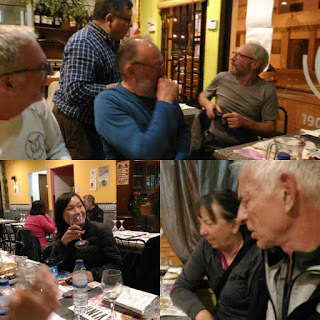 Now I just need to deal with the crowd as the last 100 km has more people, and in the case of this camino tomorrow in Redondela where the Coastal route joins the main route. 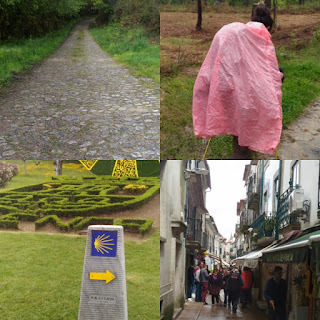 Funny how the pilgrim office in Santiago states the minimum is the 100 km of walk to get the compostela, because of that it is the not the best condition. Still, I have try this entry via Padrón. 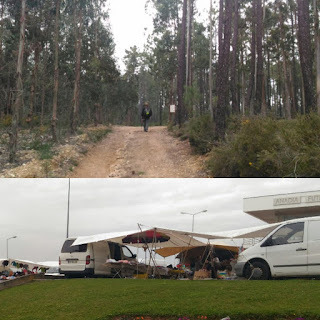 Yesterday at the Ninho nest, I had never seen a bigger congregation of Danish walkers in all my caminos, including a son who works in a oil tanker ship walking with his mother. So sweet. He said he had spent more time the last few days with his mother than in the last 10 years. The rain yesterday lasted the whole night. Stopped in the morning for a while then back on again for the whole day. The trail is from an old Roman road, many cobble stones along the way (though I think they are recently paved). Helen (from Australia) walking with a unique poncho that looks like a tablecloth. The city of Valença is a fortress (old town). Very touristy. 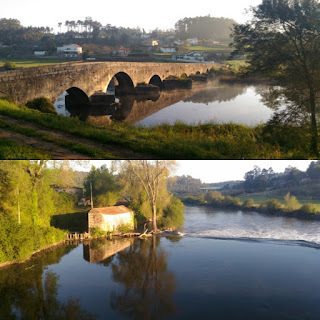 The river minho is the border, the city of Tui on the Spanish side across the river and slightly to the right.. 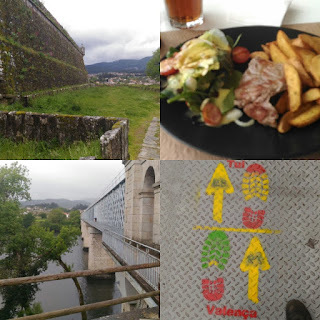 I told myself I need my last meal (lunch) in Portugal, and at the last cafe in Valença before the bridge was able to get a special order instead of the standard hamburger. Steak, chips, salad. Mid-point on the bridge marks the two towns (also the two countries). Spain is one hour ahead and the moment I crossed over I lost one hour. 2:30 pm instead of 1:30 pm. Spain's decision to follow the European time may explain why their lunch is so late at 2 pm and dinner 8-9 pm. 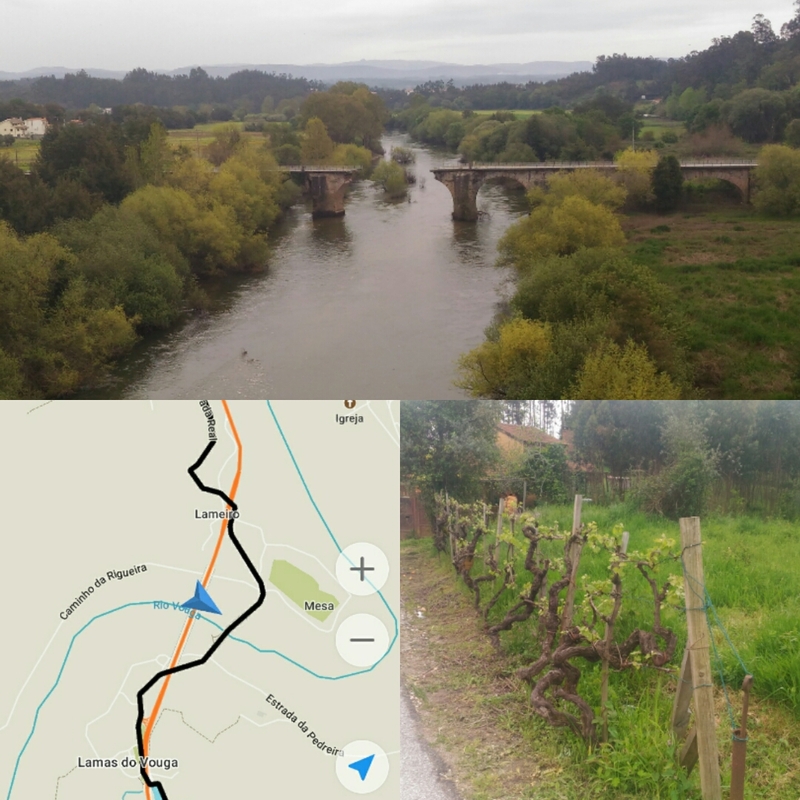 Walk along the river (alternate route) before climbing up towards Tui. 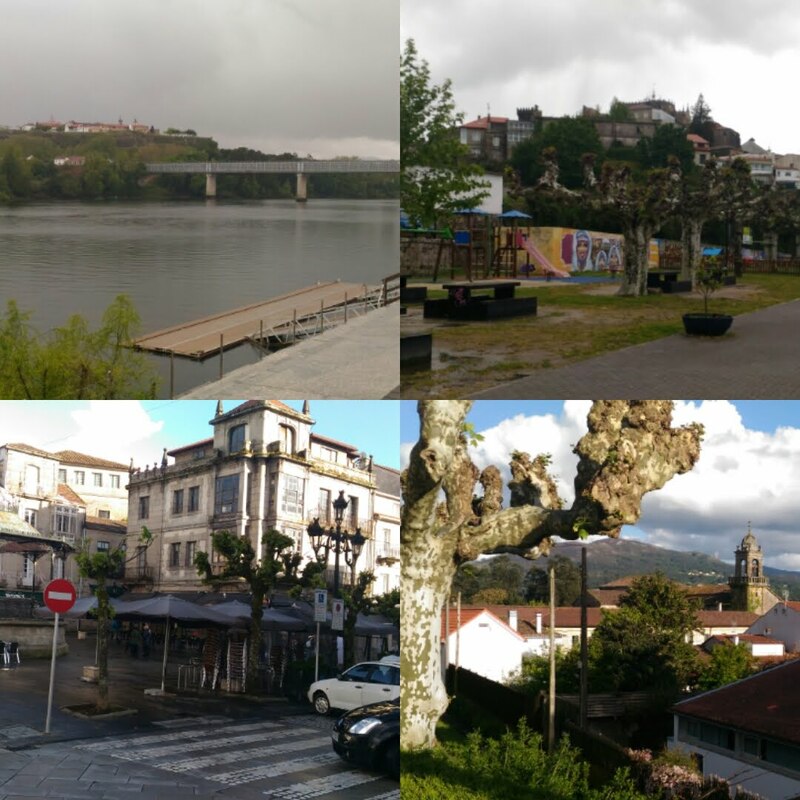 It feels like a ghost town compared Valença on Sunday (siesta?). The first private albergue is full (don't know who's inside but the next one 200 meters down (San Clemente) is quite vacant. Sophie (from Canada) and me are the ones for the last few hours, although she mentioned when I was in the showers that the Danish couple took the private room upstairs. So cold in the albergue with 10 beds (tiny heater) in our room (3 rooms in total) with the rain still outside until the evening. Just want to get dinner quickly over with and have a early night's rest. 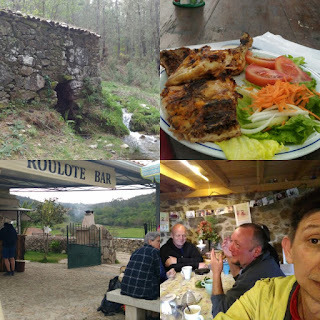 The guy at the albergue recommended a place back in the center with pilgrim menu anytime. 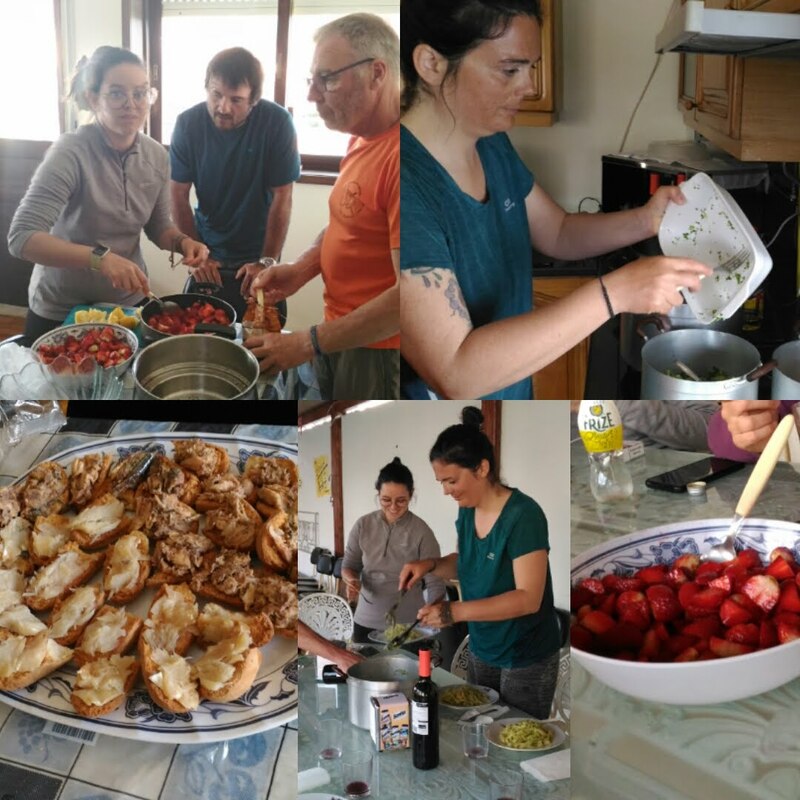 In the evening when we left for dinner the rain stopped, people were out in the streets again (much like Spain after their siesta) and we got our pilgrim menu with desserts and coffee for 8 euros. Back in the albergue a Hungarian mother and daughter. Think that's all for the day, the four of us all on flat (not bunk beds). 18 km today. Short stage but with a big climb. 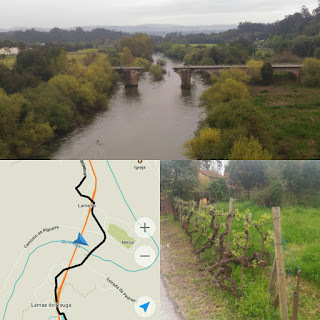 Not crazy enough to do 38 km to Valença/Tui. The thing about association or municipal albergue like in Ponte Lima are the number of beds in each room. The bigger they are, the earlier you get awoken by the noise from those early risers. Didn't want to walk 800 meters back on the bridge just to have breakfast. A German pilgrim said there is a cafe 3 km along today's path. Yeah right. In the end it was more 6 km. Arghhh. That was way too long before I had my first cup of coffee. Two cups and lots of food later it was steep climb up to the top. I was impressed by the few cyclist that attempted the same path. At some of the steep rocky path they even had to carry their bikes up, the only time walking is a little faster than a bike, at least until the downhill part. Good thing they had a support vehicle waiting for them at the top (no racks or panniers to weigh their bikes down). Still an awesome feat. It's beginning to look like Galicia (north western Spain). Gate barrier to keep the sheep on one side. They also harvest pine oil judging by the cuts in the bark of the tree although the scale is much smaller than in Spain. A nice vista at the top, then it was downhill. My tendons have more issue with downhill than uphill. A few km later there was a cafe built just inside gate of a house along the path. They have a stone grill at the gate for bbq chicken. The smell is already enough for me to have them. Olivier, who was leaving after having the chicken said it was good. Half a small chicken with salad for 5.50 euros. A happy camper with just a few km more to Rubiāes. There was an albergue there with a modern cafe, shop right before Rubiāes. Even with the added facilities, no more municipal albergue for me today. 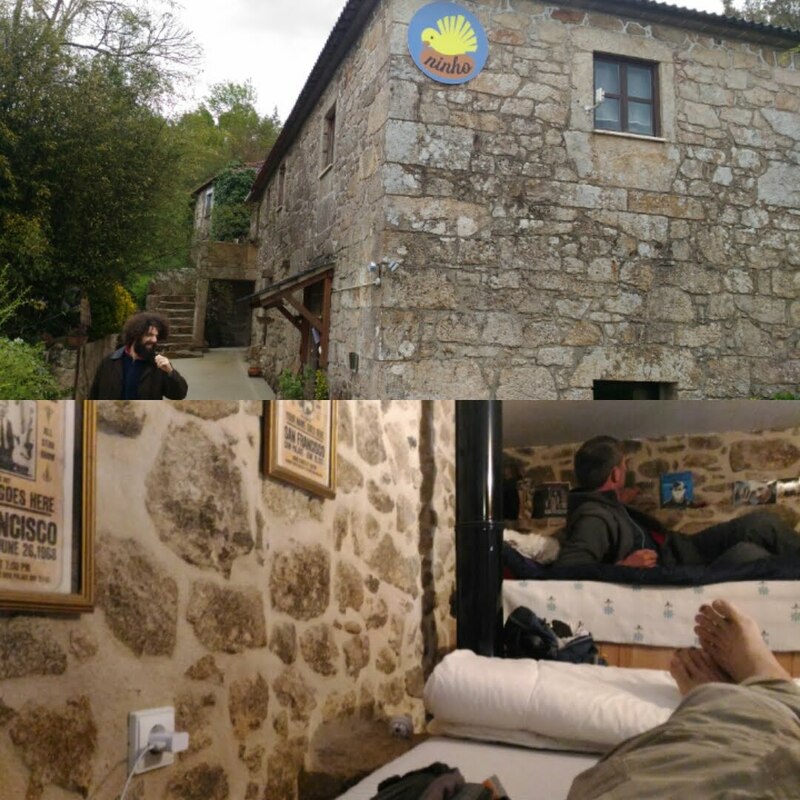 Ended up with a nice private albergue, Ninho Nest. Nice 200 years old house. 13 euros with breakfast, no need to walk for for breakfast in the morning or to to pay for it. It is indeed like a nest. One of the earlier arrivals I got a nice bed above the kitchen, next to Olivier (again I didn't know he was there, or other private albergue in Rubiāes, or had continued walking to Tui). Lucky for me the moment I got in it started raining. The rain was not long, an hour or so, but for those attempting the longer distance today will surely regret walking on. People from Denmark, Netherlands, France.... we all having afternoon tea with ginger, mint picked from the garden and honey. Pretty soon the place is full. Less than 20 official nests in the multi-layered areas in the house wirh two toilets, it was full pretty fast. Aurelius the Brazilian also came here. Very cosy here. The three of us share a load at the washer/dryer for 5 euros. (Pilgrims usually only have 3 sets, only 2 sets to wash) to be better for the environment and save money. A husband and wife runs this private albergue. From some of the photos on the wall, I think he is also a musician. 35 km (feels like 37 km). 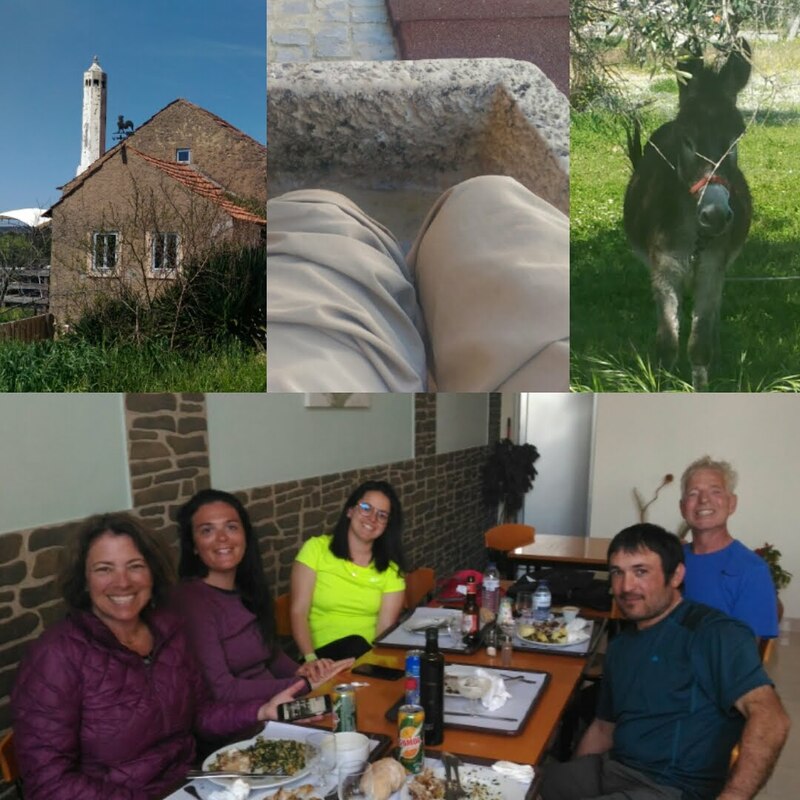 Why do I always do that on the Camino and with a less than perfect left foot I will never understand. 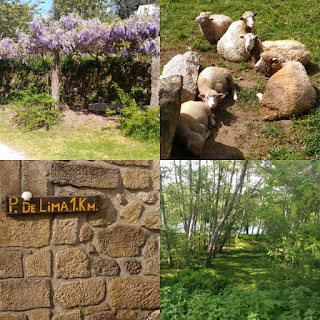 Maybe it's because the place to stay at mid-point today (Casa Fernando, more like an albergue, donarion based) is a little short on distance, too many older folks who find it hard to do Ponte Lima distance, etc. Also the weather was really nice in the afternoon, sun/cloud with cold wind, perfect for walking. The day didn't start well, with rain in the morning which stop around mid-morning. Aurelius the Brazilian really woke us up too early and left the hostel at 6 am! (without breakfast). Breakfast was excellent at 7:30 am, the full course with hot eggs/bacon and cold cuts/cheese, etc. With Olivier smoking outside 15 mins before breakfast was ready. 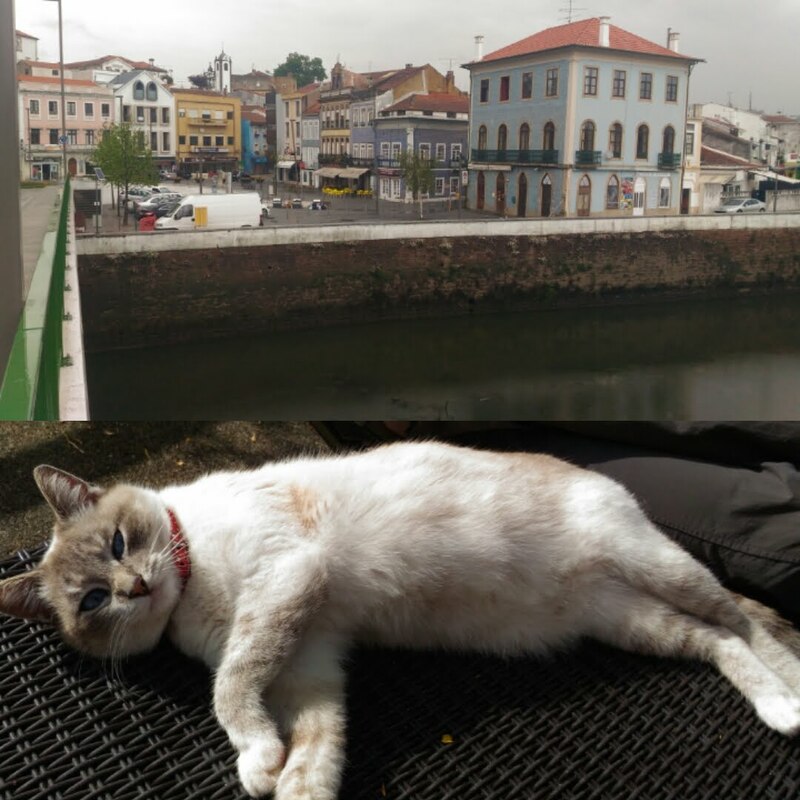 We both said Ponte Lima is too far, but later he was opposite my bunk bed at the albergue there. Haha. Some pilgrims think alike. Lots of bicycles starting from Porto 230+ km to.Santiago (cyclist needs minimum 200 km while walkers 100 km to get a compostela in Santiago). Interesting setup, some of their mountain bikes have smaller 24 inch wheels, and today I even saw a couple of electric assist mountain bikes. Not sure if that is allowed, but then again who is going to check it at the pilgrim office in Santiago? Banana trees here? Is that possible? Such a nice walking day after the rain. Some residents in a village even put out a stone bench surrounded by flowers as rest point for pilgrims. Still, by 2 pm the body start to wear down. Luckily there was a cafe just off the path where I order a burger and fries. The young woman and her sister at the bar wanted to learn a few basic words in Chinese for the few Chinese pilgrims that comes into her cafe. Really? Wrote just hello, thank you and goodbye (the best I could, added ā for part of hello as a better approximation for Portuguese speakers). Arriving in Ponte Lima almost 6 pm. 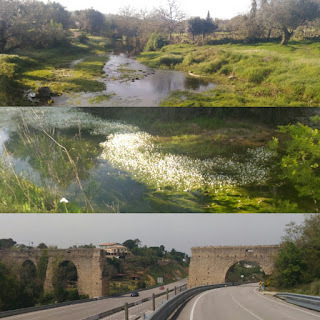 It is a touristy place with the old ponte (bridge) after a more modern one. Turns out the old bridge is for pedestrian only. Lost the piece of paper today I scribbled from Jim's guide on the lodging from Porto to Redondela (my lodgings map overlay on the phone assumes the coastal route), seems like I may need a get an expensive hotel. Saw a guy that looks like a pilgrim at the cafe and ask him about lodgings. He said there is an albergue de peregrinos at the end of the bridge. Yes! 5 euros for just bed, hot shower and kitchen which I would not use. Big albergue. Don't know how many beds but my number is 51 (top bunk! Argh!). Made a bet after seeing Olivier that if no one claims the bottom bed I will buy him a beer. It is already after 6 pm but one never know..
No shower... yet. 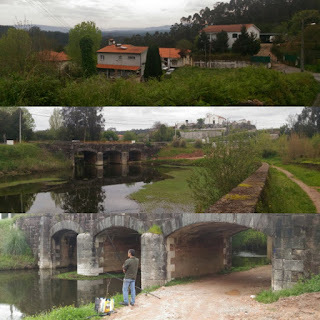 Seems like there is nothing much after crossing the bridge except the albergue. Crossed the bridge back with Olivier for dinner. He said he has a craving for Pizza for the whole day. That statement also made me crave for pizza. Asked around and got a cafeteria that serves Pizza (probably the packaged type but the dough was still quite good, or maybe it was just the hunger speaking). Back across the bridge and shower. Oh, so good. It's one of those button pressed and released type showers. I lterally just put both hands on the wall and button and stand under the hot water for like 5 minutes before doing any showering. No way I can do the crazy 38 km to Valença (with much higher climb) tomorrow. Not in my condition and I think the majority in this albergue today will also end their walk after 18.9 km tomorrow in Rubiāes. I hope there is enough space there. 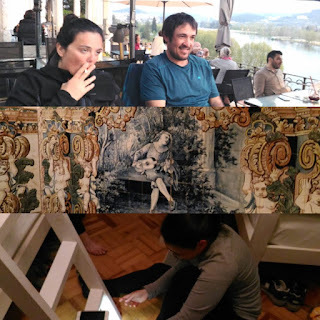 Dinner last night with Olivier and, another French couple and a Brazilian guy Aurelius (Olivier's room mate). When I return to my room I discovered I too had room mates, two backpacks besides the other double bed. Two blonde ladies came in later after I had just fallen asleep. Hard to know where they are from judging from their whispers. Good thing non of them took showers (maybe they plan to do it in the morning). 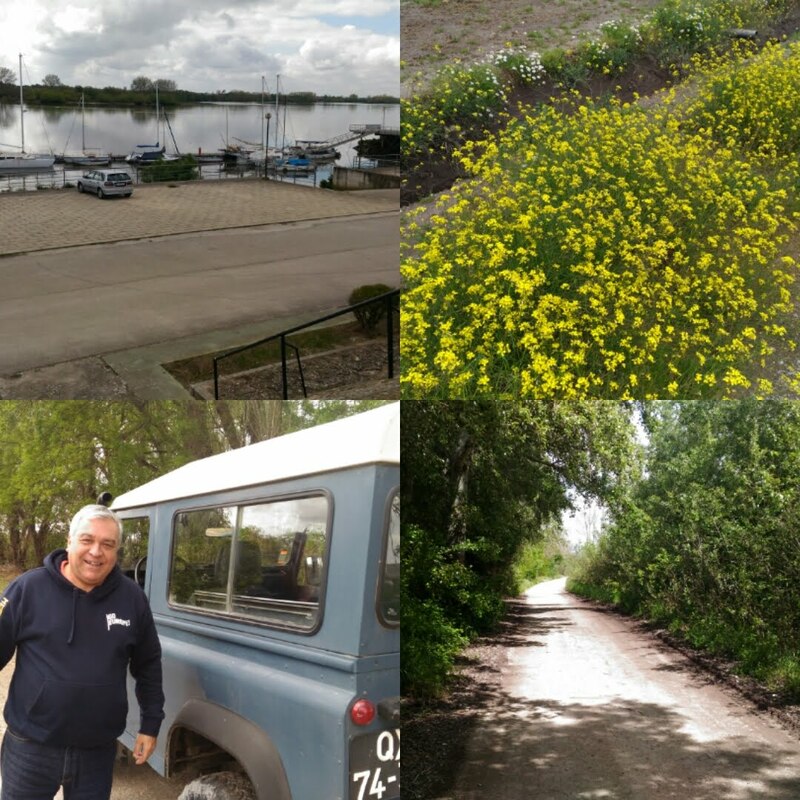 27 km today, much like yesterday. Darn, it might like that all the way to Santiago. Yay! The lady at the cafe this morning understood my coffee order (cafe galāo), probably because of my stuck nose early in the morning. Portuguese is hard for me to enunciate especially those nasal sounding vowels. With the heel issue and slight pain, my engine is only at 70 percent. The 200 km marker 12 km before Barcelos. I had lunch at a place with no pilgrims (only local) next to the gas station with around 8 km to go, the cafe/restaurant at the end of town. Most of them stopped at the fancier first cafe in town. Saw a local young man eating breaded pork cutlet. I want the same! Normally lunch is a small sandwich and/or nut/raisins/muesli-bar for me so when the opportunity and timing presents itself, another heaven. For my cutlet I chose veg and rice, plus coke and coffee after that. I got slightly more than 4 euros change when I pay with a 10 euros. Is that even possible? For the last few km I was chatting/walking with a young German Leon? (still in university). Decided to try the association's albergue together with him (probably like 6-8 euros). It was full. He checked his phone guide and said there is municipal one another km or so into the city of Barcelos. Not me (especially with the heel), when told there was a hostel 30 meters away I jumped at it. 15 euros including breakfast, 3 beds a room, out of Leon's budget. He moved on. Our conversation will have to continue another time, provided we see each other again. One backpack was already there in the room. Some washing on the sink (a patio to hang our clothes to dry) and heavenly hot shower later, when I got out, there is Olivier on the 3rd bed. Later, we see who took the first bed, Aurelius from Brazil. We never saw each other at all walking today. Such is the camino. Further down the road there was a bread shop that served coffee with lots of locals eating and taking out the bread (good sign). Tourists normally take their breakfast where they stay so at this hour it's only the locals outside. In Porto, it could mean either 60 cents or 1.80 euro for a coffee depending on which cafe you choose, thanks to the tourist. Besides the normal bread with coffee I needed something more (last night was just a sandwich due to the late lunch with Carolina). They have a Pāo de deus special (Bread of God? ), 4 for 1.90 euros. Ate one and the rest were gone before noon. Darn they are good. A simple bread topped with coconut and sprinkle with fine sugar. 1. They were all on the coastal route. 2. They took the metro/train to the outskirts of the city saving 12 km (which I should have done). Turns out it was the latter. In any case the first pilgrim I saw was a Dutch couple Wilhelm and Ona? (Or Anna). Only before noon did I see some semblance of the countryside. The road is hard and cobblestone in many places. 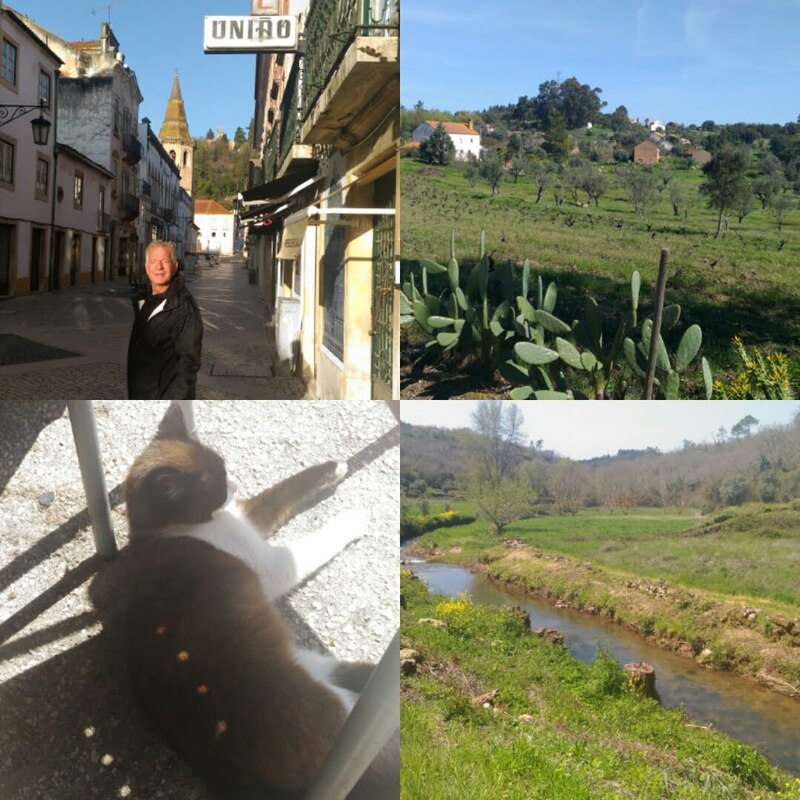 Really need to rest the heel and was and so happy to be in Vilarinho around 3 pm at a slower than normal pace. Lodgings here are basically homes. Casa Laura another 150 meters down from the town or Casa Vidal 250 meters before. Food and drinks are back in town although Casa Laura has a cafe next door, so it's more walking later for dinner. Mr. Vidal has a nice pool (too tired to jump in), he gave me a room with 2 big beds (a bit excessive). Wanted 15 euros for it instead of the usual 10-12 euros. It's not for me to argue, just want to stop and rest after walking all the way with a bad heel (no subway). It's a washing day, which should be dry pretty fast in this sunny weather despite the colder wind. Meanwhile there is a French guy in the next room, Oliver from Brittany and two French ladies I heard on the first floor. Had a drink at the cafe in town with Olivier. Waiting for 7 pm to eat at the restaurant nearby. 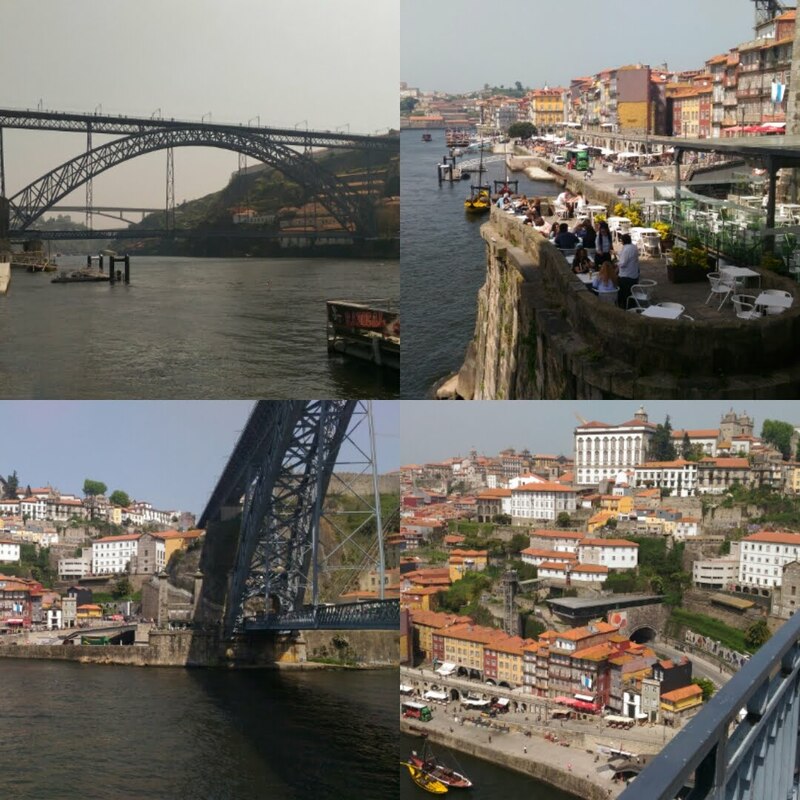 My plan was to be in Porto today. 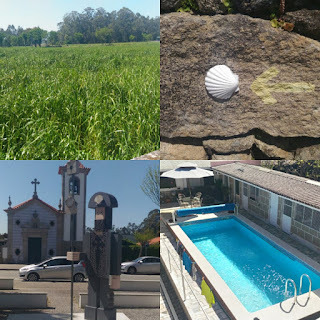 So I either do a longer stretch a few days back (too late now and also I want to stay with my camino family for a long as I can) or a long stretch today which leaves me no time to see Porto. 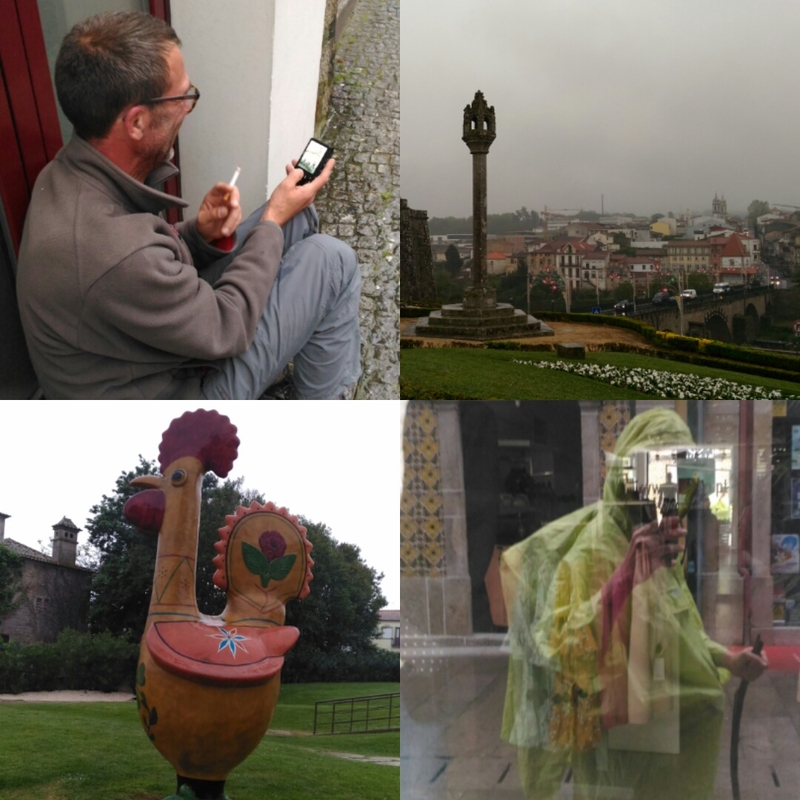 Third option is to follow Carolina and take a bus to Porto. Have to be with my camino family for as long as I can so joining Carolina is the other option. 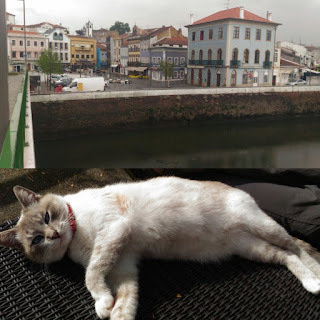 She has a friend coming to Porto and they will walk the coastal route in 2 days, hence her reason for the bus trip today. 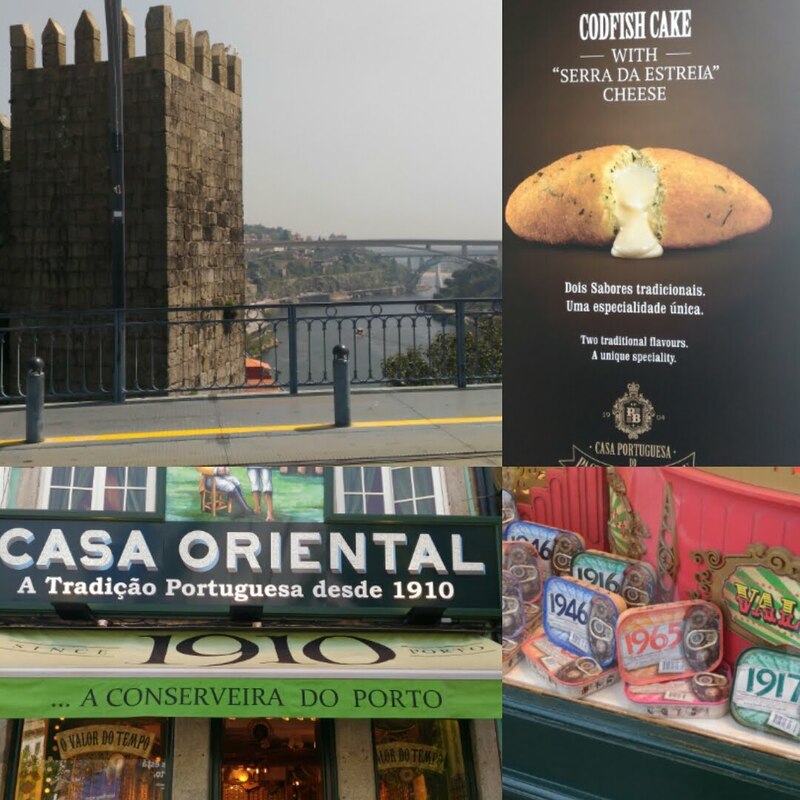 Porto is a very touristy city. Not many cheap accommodation. One of them on my map overlay did not exist (became a tourist booth instead). Porto being hilly and I didn't want to spend too much time looking with my backpack, I just settled on the 'Yes!' chain of hostel, one of those high tech hostel found in big cities, 4 to a room (early bird, got a lower bunk, yes!) for 20 euros + 2 for city tax. Breakfast option is an extra 2 euros but from 8 am is a bit too late for me. The cafe downstairs with lots of sandwiches opens earlier in the morning at 7 am. At least the place is along the central Camino route. There is an alternative coastal route that was created a few years back and many people chose that route. 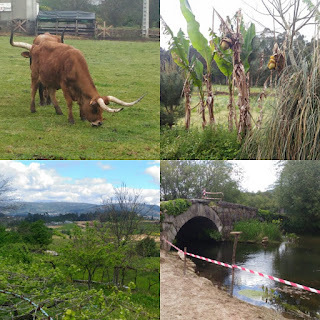 I rather like countryside, feels more like the Camino for me so I will be walking the old central route tomorrow. The coast is also slightly longer (additional day or two) before converging with the central route in Redondela. I also took the opportunity to recharged the data on my local SIM data (already 14 out of the 15 days limit). Just 1 GB for 15 days is more than enough now considering most albergue has wifi. No need for packages like unlimited social media, YouTube, etc that is so common here. I guess this is what happens when we loose net neutrality. At the small phone shop (mostly run by Indians) I was told it's easier to get just another SIM card instead of recharging. Fine. The total without all that additional packages? 2.5 euros for 1 GB (15 days) with SIM card!!! I felt ripped off paying 10 euros 2 weeks ago in Lisbon. It's like paying extra for cable channels you don't watch. Tried the cod fish croquet with strong cheese (blue?). Not bad, but expensive at 4 euros. Would be cheaper at a sandwich shop, too late. 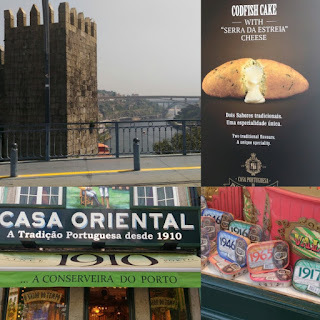 Like in Lisbon there is a place (Oriental house) where they sell canned sardines with your birth year. I saw mine at the window. Not sure I even want to get it assuming it was canned on the year of my birth. They are probably expensive too, and may not even be edible. And now there is only one (me). 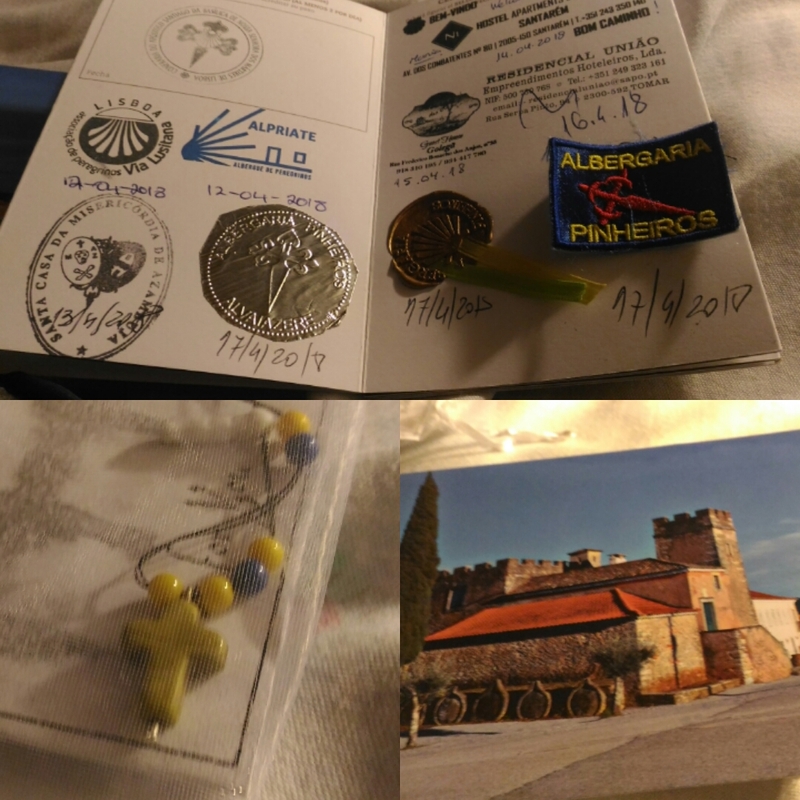 I just lost my camino family. Glad to know that Lucia and Ricardo will still be walking together to Santiago. 23 km. 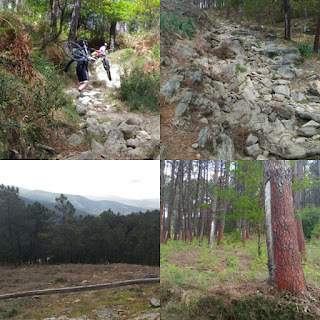 A hard terrain of mostly tarmac and steep slopes. As usual morning was good. Left the albergue after the self service breakfast as 8 am (their local bread was fantastic). After that it is all on the road, weaving and crossing the track left then right. Too many industrial areas after that, one can feel the density of people and cars increasing. That and the hot weather before noon makes the walk hard. 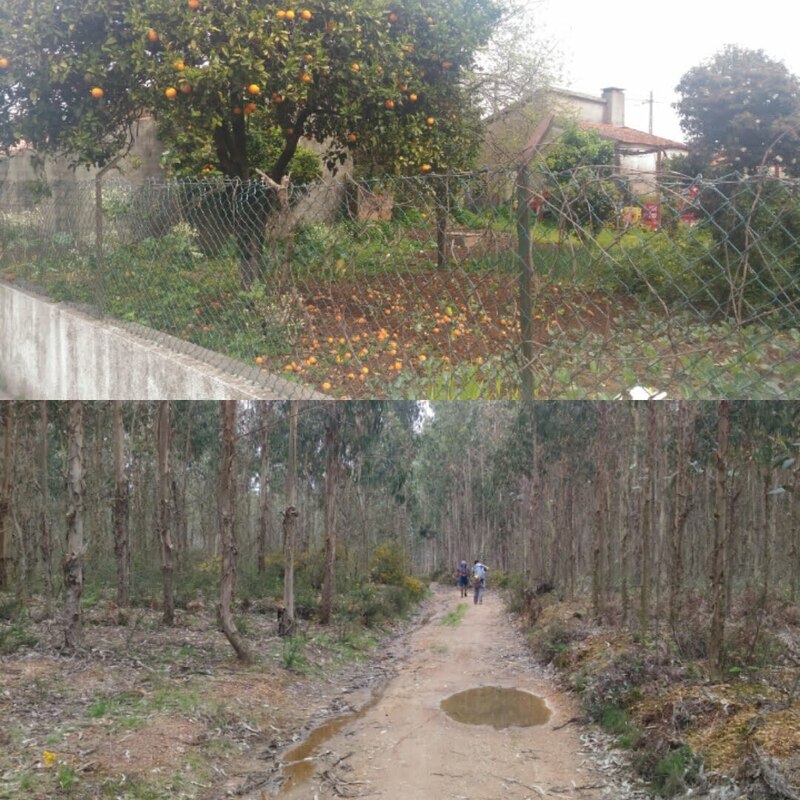 Towns/cities like Olivera de Azemeis and Sāo Joāo da Madeira are on top of hills making it even harder. I was ahead after the first break. We I got into Sāo Joāo da Madeira there was a big hospital and a huge mall together in the same complex. Decided to have lunch there to let the others catch up. Didn't feel awkward entering the mall with a backpack, hat and all. Actually I did but pretended not to care. The restaurants are actually like a food court next to the cinema. Had a nice local trendy speciality burger. It's either that or burger king or Chinese. The cineplex are showing 'Ready player one', 'Pacific Rim 2' plus a few others. Heck, if they are not here I may well cool off further watching a movie (kidding). It's just over a km further where the lodgings are. Not many choices here in Sāo Joāo da Madeira. Just the Solar residencial or the hotel A.S. Sāo Joāo near each other. Ricardo turned up before I got to there. Then as we were at the residencial, the ladies turn up. Great timing. Turns out it's cheaper at the hotel 39.5 euros for a double instead of 45 euros at the residencial. The ladies got a room while Ricardo and me shared one. 7th floor, highest for me so far in Portugal. Overlook the Solar Residencial and the square. Many others including Jim later stayed at the residencial. The 3 French guys managed to find a cheaper old folks residence which I tease them later during dinner for looking the part (which they probably do since they said they are in their 60s). There was still the dinner and the breakfast tomorrow to say goodbye. Too much food for me today as there I normally lunch is usually just a mix and/or of a small sandwich at the bar, pastries, raisins, nuts, banana, orange, oat bars, etc. 23 km. It was only 17 km to Albergaria de Velha so added another 6 km to Branca's albergue. Menacing sky but in the end no rain. More trails, less tarmac, which is good. Idyllic countryside with some great vista and people fishing. The broken bridge from a flood a few years back was supposed to be our route but now replace by the bridge along the main road as seen from the map with the overlay. Still can't get over the small scale farming here. This has got to be the smallest vineyard I have seen, just one 20 meters row of vines..
(Import from Australia). These can be dangerous in hot dry weather. The rain's back! It started in the late morning until late afternoon. Distance about the same as yesterday, another 26 km. 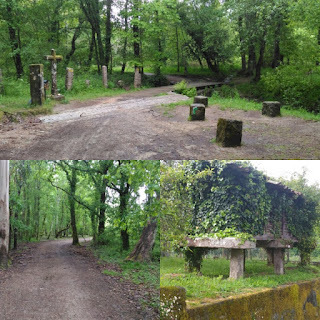 After a tearful goodbye to Julie and leaving the albergue, it was a nice walk in the woods. 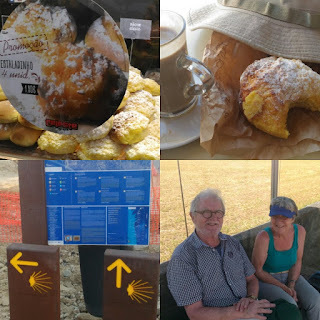 Had the first coffee 2 plus km later (the albergue's cafe wasn't open till 8 am). Except for the first 2 km of walking in the woods, the rest of the day's walk is on tarmac. Sunday flea market outside the football club. Was going to complain about hard surface walking when it rained at around 11 am. Still wet but at least no mud in the hard surface. Got an email from Ryan. He's in Porto. Must have taken a bus/train there from Coimbra. Probably decided to skip this part and continue his walk from Porto. 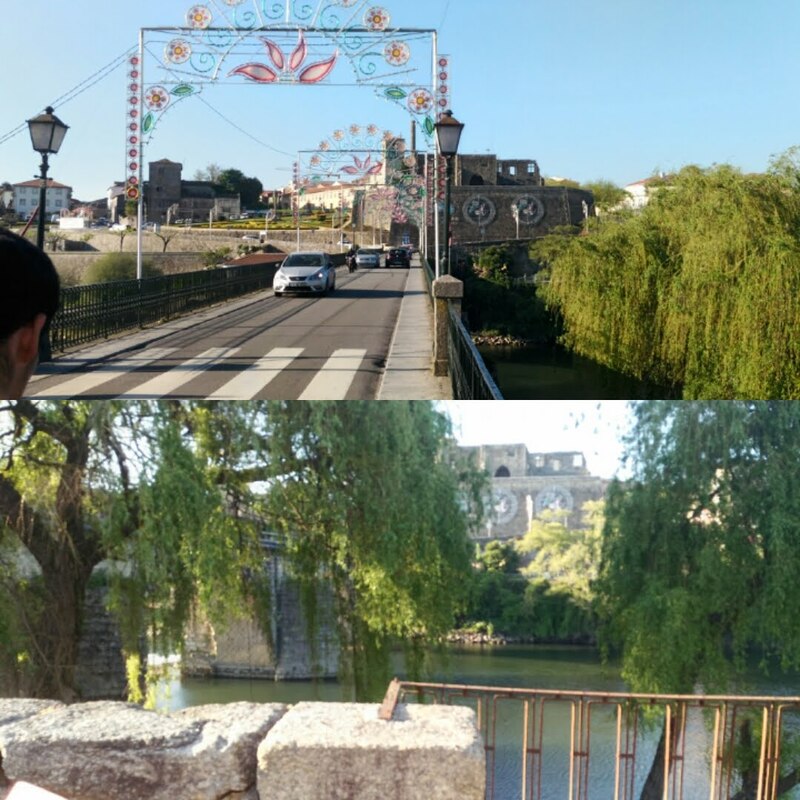 Nice city center of Agueda by the river. 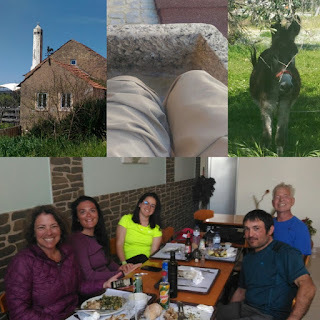 The albergue is situated uphill right outside the city when I arrived at 2:15 pm, followed shortly by the other three and Jim. Little by little it was almost full. Two other French ladies (one has a bad cough, poor thing), and a girl from Japan walking Camino Frances then down towards Lisbon (even more aggressive than the old Korean couple). 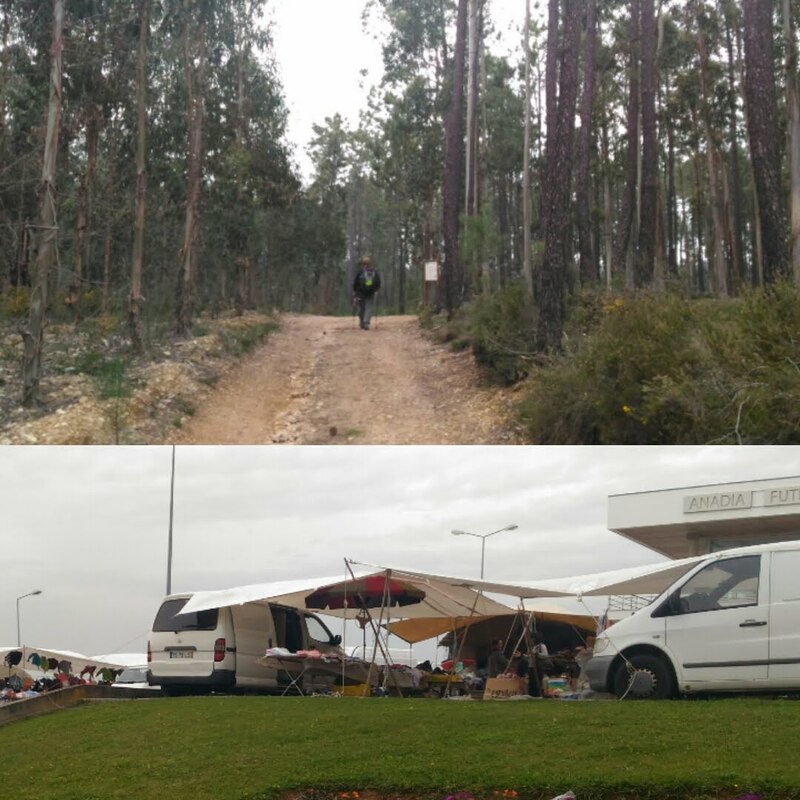 The last were the three Frenchmen from the early days of walking, separated at Santarém as they headed towards Fatima and now back on the same track towards Santiago... like a reunion. 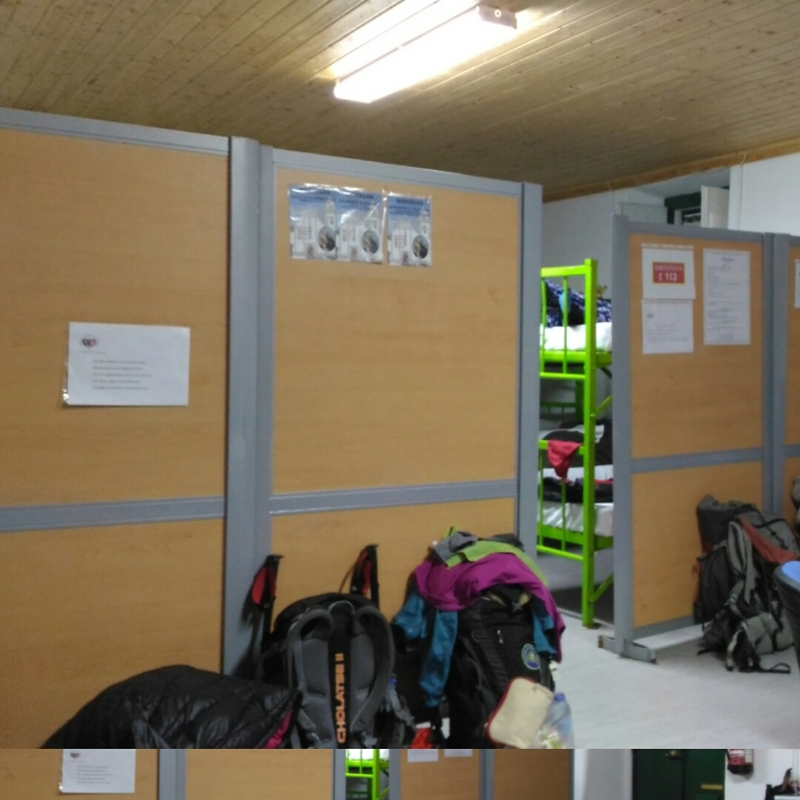 No dinner at the albergue (12 euros, breakfast 5 euros) but it has a kitchen and the ability to order for food delivery. 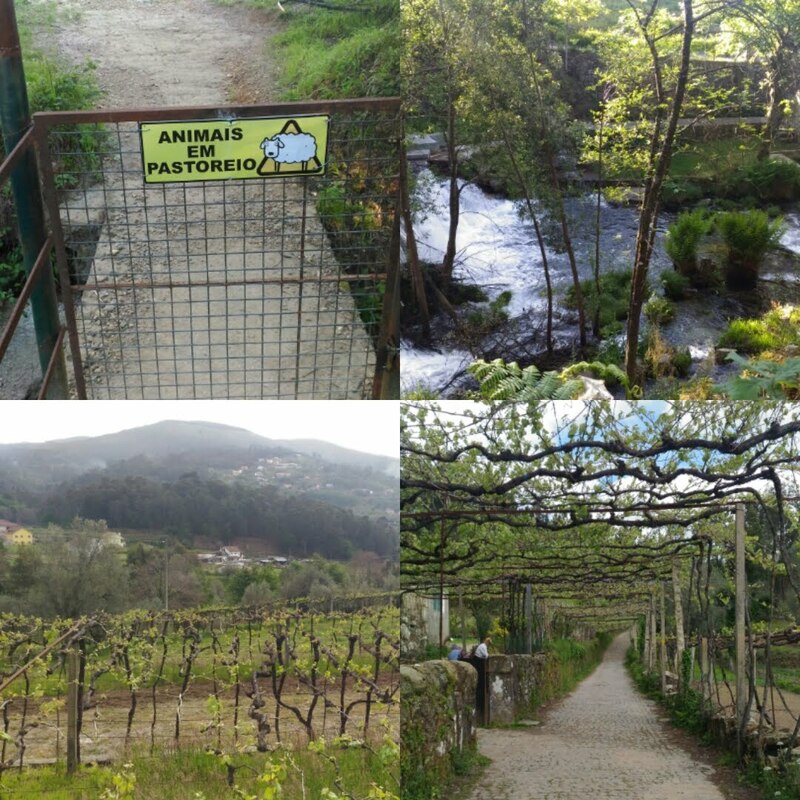 The supermarket is a 5 hundred meters before the albergue and downhill. I ordered a delivery meal for 8.50 euros instead. Next thing I know the three of them came back from the supermarket with stuff to cook, including for me. Too late! Bad coordination, sigh. Never thought that they will go downhill and up again. Jim outside the reception waiting for our food delivery. Lucia making spaghetti carbonara later. Could only take two mouthful, was too much after having my food delivery. An excellent spaghetti given the fact they could not find the right cheese and bacon. No laundry today, just hope the shoes, socks and the pant's bottom cutoff are dry in time for tomorrow. At the first stop spoke a bit with a woman (Brideen?) from Ireland. 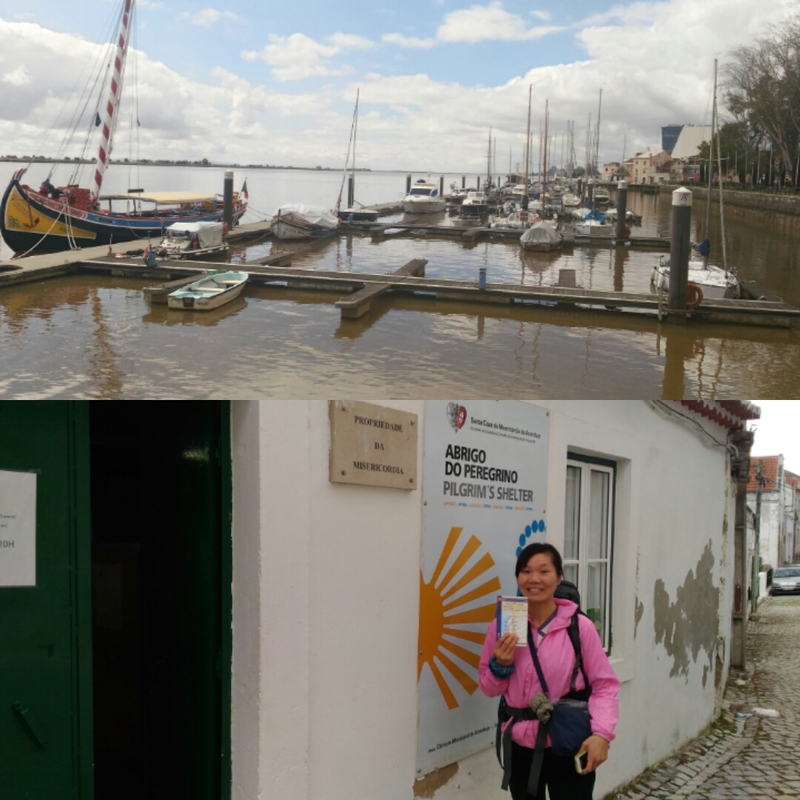 She does the walk with shorter daily distance from Lisbon and will be stopping in Porto. Also, an English guy Jim starting his first day from Coimbra. Second stop in Mala, the whole from yesterday except Julie (still behind) at the same cafe for food and drinks. I left first and before Mealhada, reconnected with Brideen on the road. Last opportunity to chat as she will be staying in Mealhada and given her daily mileage probably the last time I will see her. That and one more stop in Mealhada for coffee with her. The Italian ladies and Ricardo passes by. The albergue is in Sernadelo (1.5 km outside Mealhada). Saying bye to Brideen (she's got a hotel in Mealhada) and a short walk later and day's walk is over at 2:40 pm. Good day to do my laundry. Ryan was not here (no idea where he ended up). I like it that many of the albergue here in Portugal are actually hostel that normal cost 30-40 euros for a private room but have pilgrim level beds for 10-12 euros. Usually that means also the same place for food especially when it is a small village. Julie came in later. I helped her again (last night too) to puncture her blisters (difficult to reached heel area) with my needle. Like Carolina, they got them when the weather turns hot while mine was way back during the wetter days. 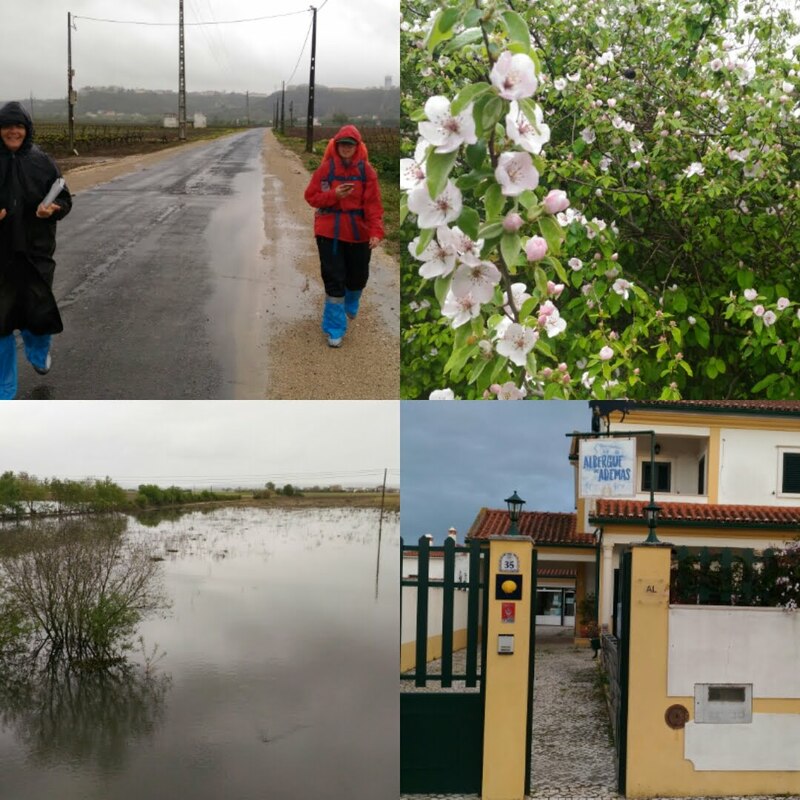 Today's walk is not as good (hard road walking) as the previous few days from Tomar to Coimbra. Nice roast pilgrim dinner menu with roast pig. Superb, and only 9.50 euro. This time with Jim from UK with us. Julie decided to take a bus to Porto tomorrow. Maybe five again if Jim join us at the end of tomorrow's walk. There are other French walkers here too but they pretty much stayed to themselves. Then came an old Korean couple came today. 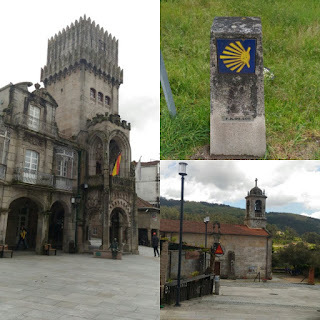 They walked the Camino del Norte from Irun to Santiago then head south here. That's around 1100 km in 46 days. 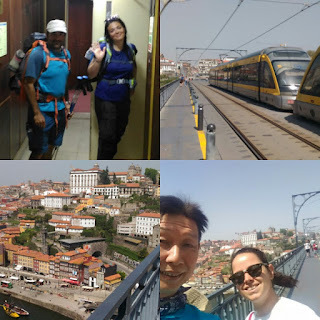 Tomorrow they will end their walking days in Coimbra, then a bus to Fatima and Lisbon in the coming days to end their trip. Suddenly it is now 10 pm. No idea where all the extra hours went, probably from all the.merry making with the pilgrims. Two stops for coffee before Coimbra. Weaving under and over the highway visiting more small villages. Before Coimbra an aqueduct (looks medieval, not Roman). 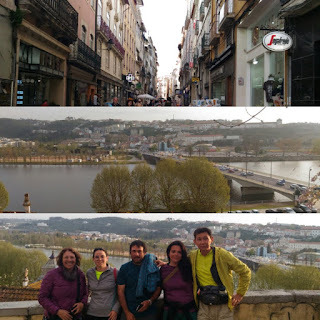 Finally, after a couple of up and down, a panoramic view of the city of Coimbra. A beautiful city and also a university town. The albergue, run by the Convent of Santa Clara (8 euros) is on my way down to the river, still very high up the hill. 12 euros, nice tiles, sheets (no towel, cost extra), best of all very central with a great view of the other side (where we came down). With sheets I don't have to take out the sleeping bag. With precise coordination, all 5 of us ended in the same room. The Italian ladies came in next after an hour and finally Julie half hour after. Ryan, as usual walked very early and was here much early coincidentally also in the same hostel. Not much communications with him. Maybe he just want some 'me time'. We had dinner up the street with a nice view of the river. Another great menu for 11 euros. Some blister management for Julie and Carolina. Another long day around 32 km on the road. Started at 7:30 am (after self service breakfast) which is better than 9 am the day before. At least I should end an.hour and a.half earlier today assuming similar distances. I was wrong to say that those who chose the Fatima way will join back in Tomar. It is actually at this sign on the path before Ansiāo, with the blue and yellow arrow in opposite direction. Wonder if many will continue here from Fatima or will most just go to Porto and continue there. Before the second stop a water wheel. Basically a pump to draw out water from a well. It works after many rotations. My maps.me app says it is a drinking place. Not sure if the water is drinkable though. Everyone except Ricardo (he makes.very short stops if ever) gathered at the second stop in Alvorge. First me, then Ryan, then Julie, finally the Italian ladies which by then it was time for me to go. The bar owner made sure everyone signs his guest book and was proud to show me entries of 200 and 45 pilgrim groups that passes by his little town. 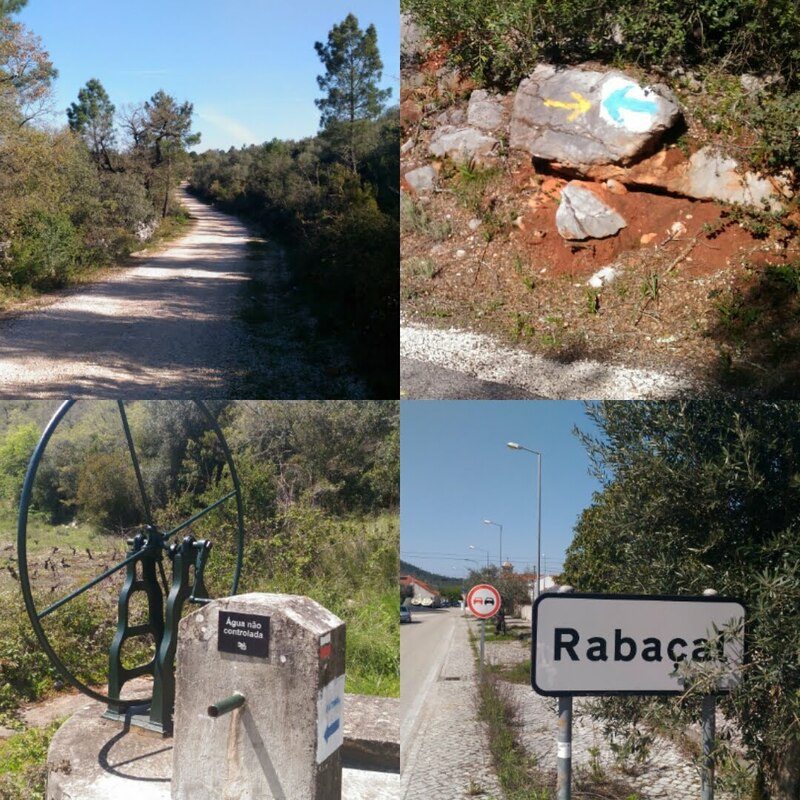 As I was leaving the Italian girls told me to go to the second lodging in Rabaçal for today's stop 6 km further. I told Ryan the same but when I got the small town of Rabaçal, Ricardo shouted for me from the first cafe/lodging. I checked the place (10 euros, no covers, have to use our sleeping bags) but it was great! Washing machine for 2 euros (shared by both Ricardo and me), drying line outside (I arrived at 4:10 pm with the Sun still glaring so no need to pay more for the dryer), incredibly a swimming pool (those small elevated ones), and the cafe even serves food in the evening. A one stop shop! Ah, the convenience. Decided to stay there instead. Didn't use the swimming pool though. Later we when over to the second place to check on the girls. The girls pays the same price but no washing facilities. They took their clothes over our place to do their washing and also the dryer instead. So nice to have nice smelling machine washed clothes! Julie came later and after having look around stayed here too. Ryan is over with the girls but no.answer when I called out for him. Hope he is not mad that I switched places. Thought he would come over for dinner with us but he never came. He must have ate at the only other restaurant in town. There is French old man with us. He came up from Fatima. Didn't see anyone else from the alternative route. Ricardo and I in one room and Julie and him in the other room that has more beds. Today it's just the four of us here. Again, great dinner for all of us except Ryan. Collected the laundry from the cloth line and ready to wind down the day. Didn't walk with Ryan today. Most of the time it is better to walk alone, no need to talk, just enjoy the view and think. Withst 5 km to go and almost 4:30 pm there is guest house. It's new, but a blessing from heaven as the road has become an oven. I had a coke (too hot for coffee). Even dipped my legs on the foot bath they had there with cold water. There are bunk beds accomodations there too. Didn't ask for the price but when I asked for business card I was.given a postcard. That place looks like a castle (probably expensive). Was tempted to stay there but if I did 5 km shorter today tomorrow will be 32+5 km. Glad I chose to move on. Arrived at 5:40 pm in Alvaiázere (town's name sounds like a tongue twister, only the Portuguese can pronounce it properly). The lodging in Alvaiázere is good, 10 euros + 4 euros (breakfast with is prepared early so.we can eat anytime (yay!). Ryan, Ricardo and me all had our own rooms with 3 beds so if no one else arrive later we all would have the our rooms to ourselves (so late in the day in this nice small town, not!). Also the stamp for the credencial is the most unique I have seen in all my caminos. Actually 3 stamps (an aluminum pressed, a wax seal and a patch for us to glue on ourselves when we get to Santiago. Met an American Julie from Montana. Said she is just doing easy bits of walking plus alternative transport (taxi?) 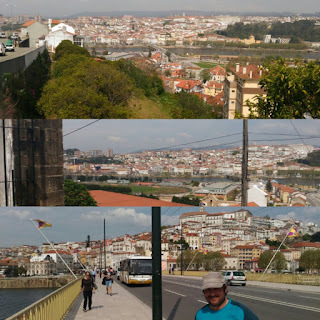 to Porto and maybe a bit of the coastal route. No Santiago for her. As for me even though I mentioned I might take alternative transport here and there, I haven't done so. I guess once I started walking (just me), psychologically it is hard to give myself any advantage. Dinner at the grilled chicken place, the gang plus Julie. Another 30 plus km day. Misty morning again but the rain was gone today and maybe tomorrow. Hot enough that by the afternoon I am walking with only one layer on top. I hope it stays that way. Today on the road the Italian girls Carolina and Lucia, Ricardo from Catalan, Ryan and me (non-Fatima group). Walked all the way with Ryan. He is crazy but in a funny way. Like when he tried to bargain with the guest house reception on the price as a joke. Ricardo has the nickname now and he is the turtle. We are all the rabbits. He always the first to leave in the morning but his pace is very slow. Also he doesn't stop for coffee or food. We always catch up to him but falls behind again when we found a cafe. And everyday he is always first to arrive like in the turtle and the hare story. 70 percent road walking today. In the morning Ricardo mentioned he booked ahead for his accommodation in Tomar. With 8 caminos under his belt it worries me when an expert like him does that. The intended hostel is 15 euros with breakfast, a great deal for a historical city like Tomar. My fears was confirmed when me Ryan and me arrived at 5 pm and place full. At least we were told there are two other pensions along the main street with a good view of the castle. One is closed for renovation and the other is 40 euros for a double with breakfast at 8:30 am. Ryan and me shared the double room but not before he started to bargain as a joke. Even as a joke he can be embarrassing (for me, not him) like that. The Italian girls booked a double room 2 streets away for 35 euros. The advantage of staying on the main street is worth the extra 5 euros. After a quick provision shopping for tomorrow's walk we had an excellent dinner at a place with a smiling lady attending to us. No menu but with soup, main course and coffee around 12 euros. Foot is slightly better slowly getting adjusted to the new shoes but the area above my ankles were swollen and a bit painful at the end of the day. Managed to get vaseline at the household stores (pharmacy would be more expensive for sometime as basic as this). Felt better now. Hopefully the swelling will be gone by the morning. 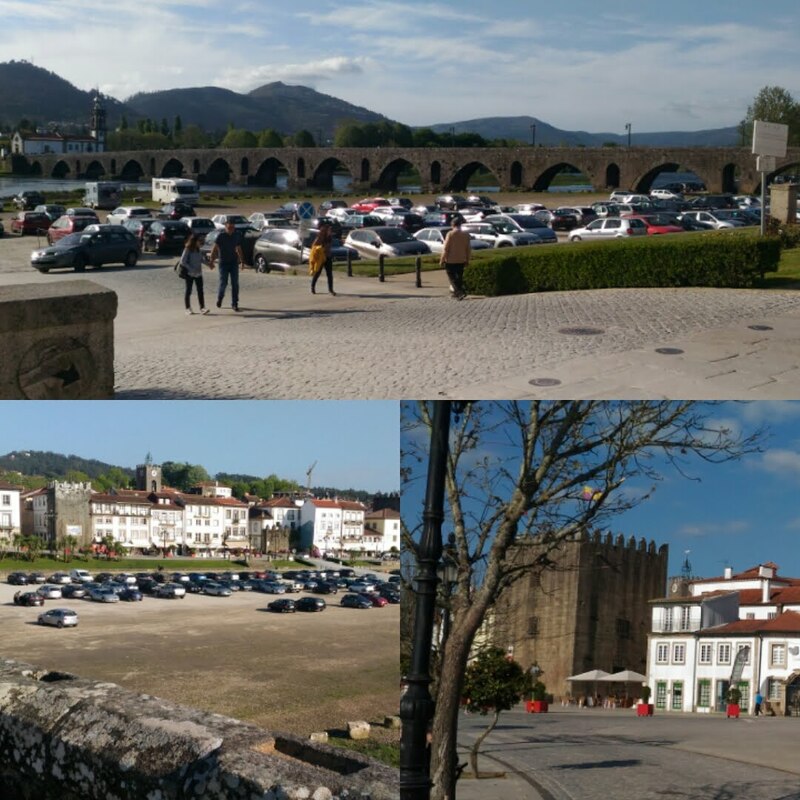 Tomar is a Templars city (like Ponferrada on the Camino Frances). 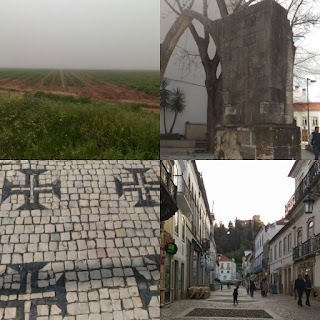 This being Portugal, one can expect a mosaic tiles of the Templars' cross on the streets. 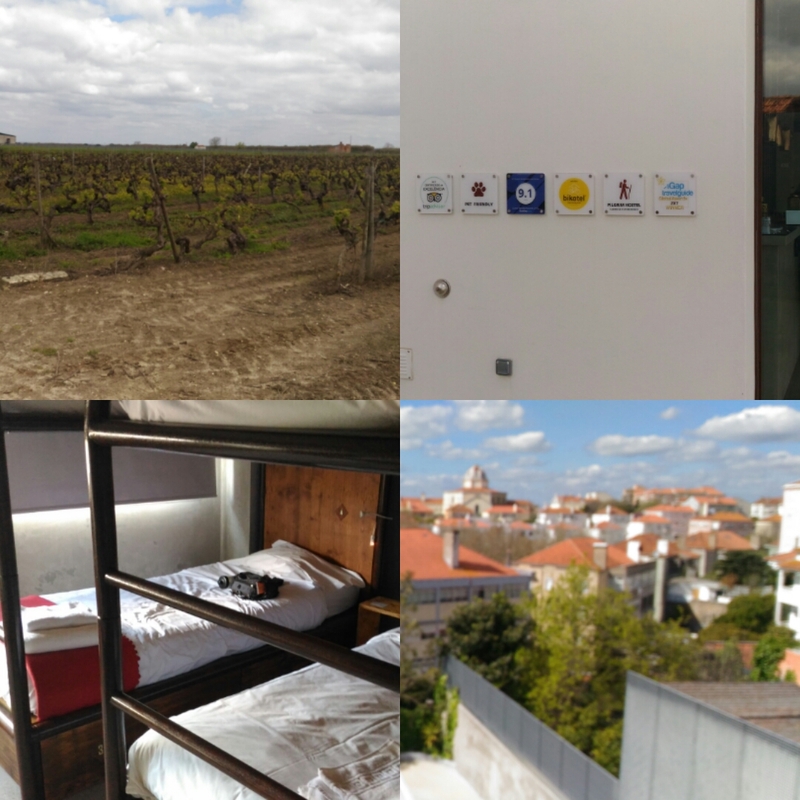 Best deal so far yesterday at Santarém at the N1 hostel. 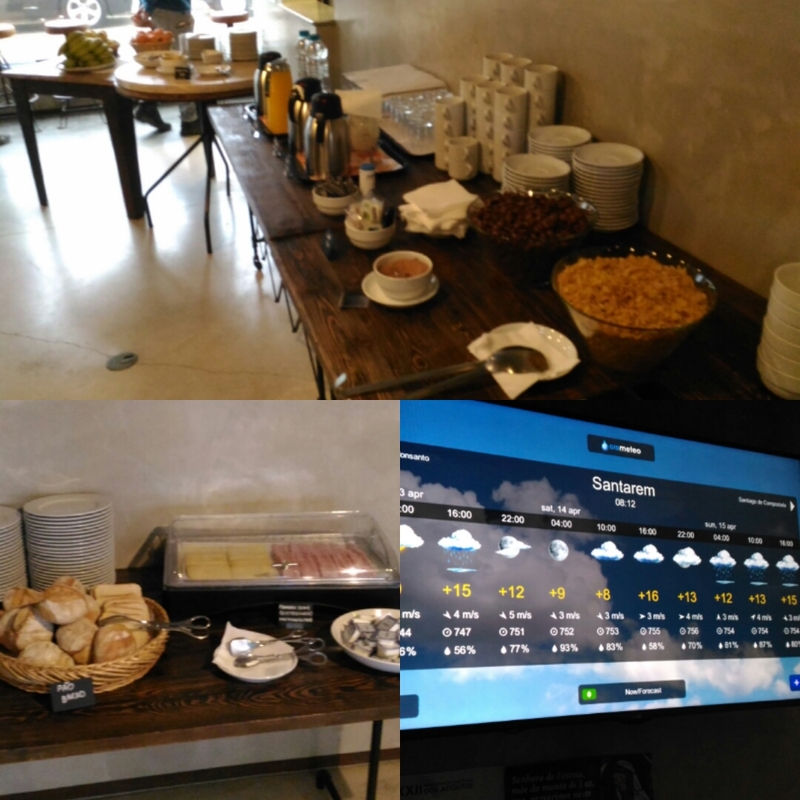 25 euros for bed with fantastic dinner last night and this morning with a big breakfast spread at 8 am. A bit late to be starting after 9 am when the distance today is around 35 km. The weather didn't help either. The view of the city yesterday at the porch was covered with fog this morning and the weather report on the screen are not promising. Luckily the rain is of a misty sort, not big but one can still can get wet when exposed for long. All the French walkers I believed (including the two sisters) are going to Fatima (the fork is here in Santarém). So we might see them tomorrow in Tomar if they don't stay an additional day. 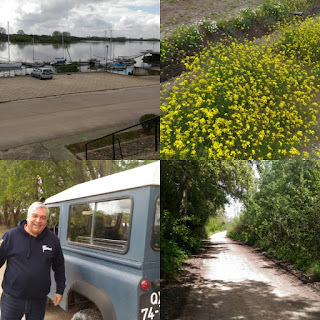 The thought of the muddy trails scares me, but with the Maps.me app and their guide we managed to find alternative route via the small roads. This I let Ryan the Danish guy know when he pop up at the bar we were at about a third of way at Vale de Figueira. His shoes were soaked and a little muddy (apparently trail runners like my old pair). Luckily he had another drier pair. Moving on one can see the lakes and plains flooded, and nothing else worth mentioning except the cherry blossoms around midway. Wind was cold and I had to keep my second layer on throughout the day's walk. The rain stopped at the first stop (sort of). 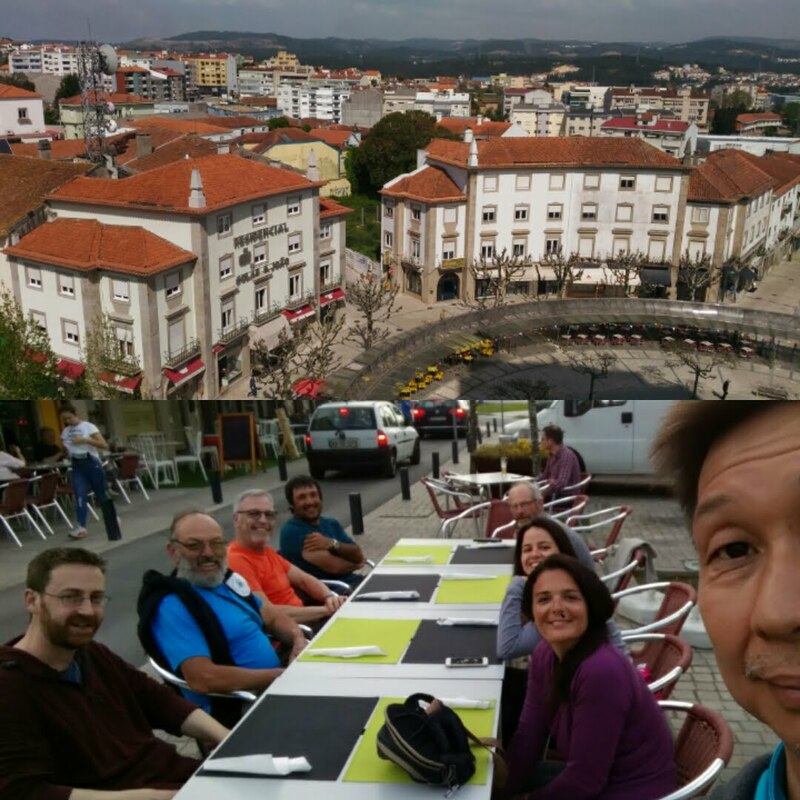 Another break in Azinhaga after a long walk for Pastei de Nata and coffee to fuel me up for the last 7.5 km. 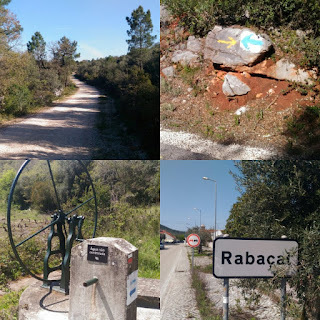 Funny how many complained had complained about road walking from Lisbon and when there is a trail we go back to the road. Mind you, the drivers here are different from Spain. They are fast even on the small roads. Finally at Golegā, took the app and found me the albergue Ademas, recommended by Migel yesterday. 10 euros with kitchen with lots of items already there (some from the establishment and others probably from pilgrims who had stayed there). It's actually a house. With pasta, egg and sauce I just cook my dinner there, same as Ricardo from Catalan who arrived earlier (same room again). Clean sheets and blanket (Yay! Another night without our sleeping bags). With too much exposure from the wind, I don't even have the energy to move 500 meters to the center for dinner. 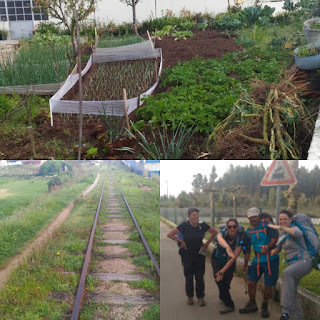 The Italians ladies came later, followed by Ryan who requested his own room as he can't sleep when distracted (hence his 3 am walk from Lisbon's dorm hostel to Azambuja (60 plus km). At least now he is covering a more sane distances with normal start time. Forgot to ask Bowie (HKG girl) which road she is taking today as she is not here (but she could be in another hostel here in Golegā). We tried to put each other on Facebook but the 'add friend' button is greyed out. Anyway, just want to lie down and rest and sleep early. Another 3 German bikers ladies just popped up. Only Ricardo and myself have the downstairs room. The rest are upstairs. Almost everyone was here (the girl from HKG and the Danish guy), except the 2 Italian girls and the two Canadians. They stayed somewhere else but made a trip to our N1 hostel. Migel the guy who gave me the flyer today dropped by during dinner to say hi. His family's wine is 16 percent alcohol, almost like Port but without the fortification. Must say that the Canadians have so much solidarity spirit as they also drop by to say hi although not eating with us. Ryan, the Danish guy left the abigo yesterday morning at 4 am because he couldn't sleep well. Can't imagine him walking with a headlamp. 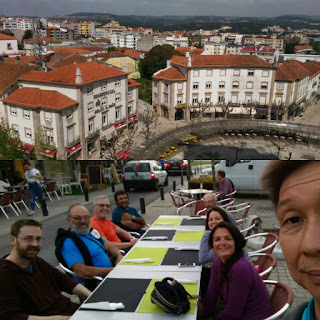 I told him that although he want to enjoy the spirit of the camino, if sleep gets too much in the way it's okay to pay for a single room at the hostel/hotel. A person's well being is more important. No pictures of food until today because I was so hungry the previous evenings and to late to take any pictures. 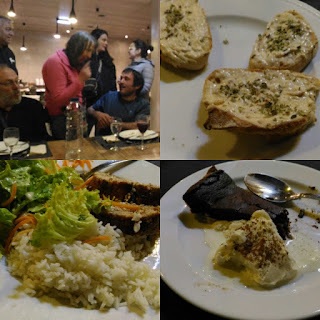 For 10 euros the food here is way better than on the caminos in Spain, and not only just for the price. Soup, sangria, wine, meatloaf with veg/rice, ice cream/chocolate tart, coffee, water. All that for only 10 euros. 33 km today despite having blisters yesterday due to.wet shoes. Should have worn the new pair. The weather is nice today. Threatening dark clouds but no rain with the Sun out in the afternoon, and for the first time able to walk with just the top layer. The road is still muddy in places. 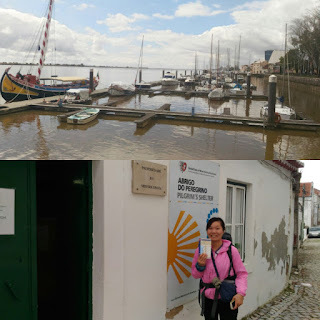 Mid point break around Valada and Porto de Muge along the Tejo river. Had a conversation with Ricardo from Catalan. He said he is shy to join us for dinner last night as he can't speak English, which I said isn't reall all English since there are 5 French last night at the dinner table. We had a short conversation with a blend of my terrible Spanish for a while before I slowed down and let him walk ahead due to my feet. 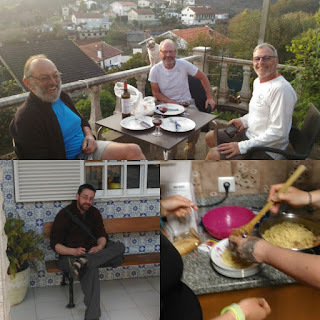 We talked about the number of caminos we had done, Catalan Independence, Paella Valenciano (long story) and the crazy Danish Ryan yesterday who walked all the way from Lisbon to Azambuja (over 60 over km! Crazy!). 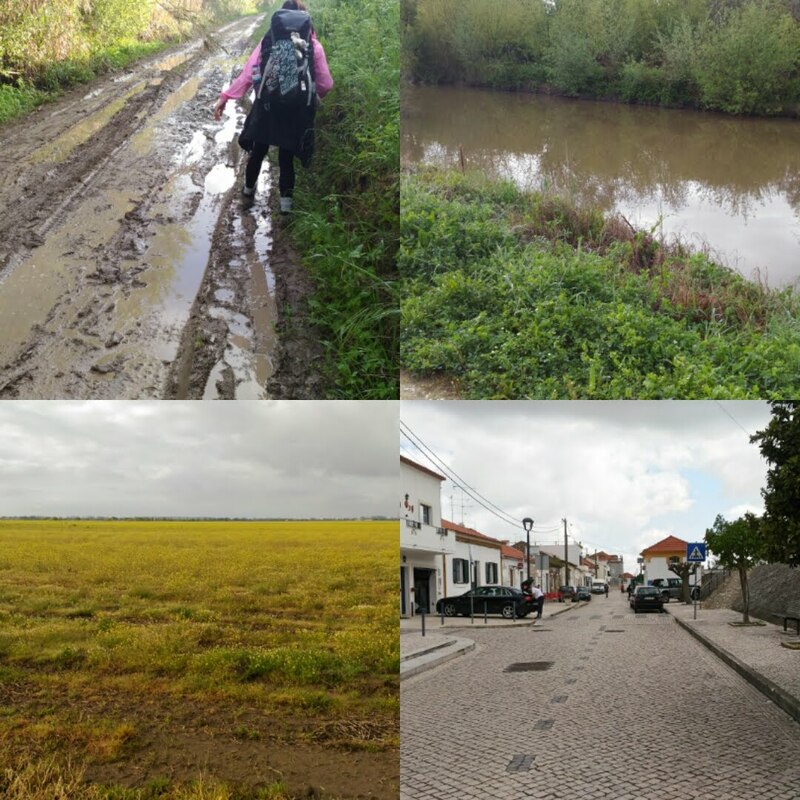 The second half is a 17 km with no services to Santarém. With the feet issue I could detour for 1 km or so to take the train but decided against it. Called it penance for Day 1 or maybe I just need some time walking alone to clear my mind. After the girl from Hong Kong and the French sisters left me at the last bar, I was probably the last person walking the stage today. 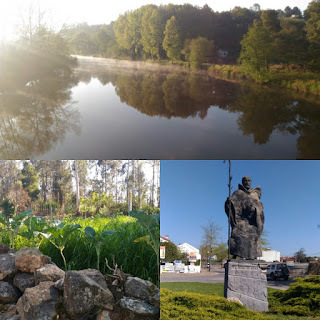 Slowly worked my way towards Santarém. 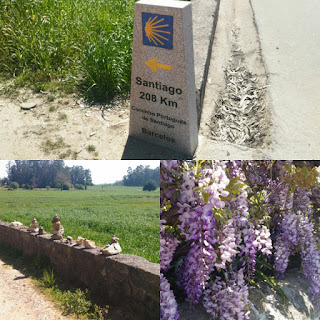 Nice spring flowers and vineyard (wonder if one can pick the grapes in the autumn like what I did on Camino Levante?). Bumped into Migel handling flyers for a private abigo in Santarém. 12 euros and if I have dinner there, the wine is from his family's vineyard. That's an option I'll decide when I arrive.